Come January first, many resolve to lose weight and exercise more days than not. For some, even the thought of dieting is depressing, especially those who have felt the effects of caloric deprivation in the past while diligently striving for permanent weight loss. But what if you could reach your body’s ideal or “set point” weight without feeling stressed, obsessed, deprived or excessively hungry? Could a better approach to weight management actually be a non-diet? What if we stopped all-consuming thoughts of what we can and cannot eat, and instead ate what we wanted when we wanted without guilt or shame? If that sounds like a radical concept, think of it as a healthy approach to eating based on intuitive eating principles. In other words, making peace with both your food and your body so you can stop obsessing and once again enjoy your food. While not actually a new approach, intuitive eating may be particularly useful to chronic dieters, individuals whose dietary restrictions eventually lead to increased binging, an unhealthy relationship with food, lower self-esteem and ultimately, weight regain over time. It appears that weight regain is the typical long-term response to dieting rather than the exception. Yes, self-control matters, but not as much as one might expect. While willpower or self-control may play only a small role, there are theories as to why we regain the weight we struggled so hard to lose. One explanation holds that the body physiologically defends a genetically-based set weight. There is evidence for the idea that there is biological control of body weight at any given time. In our world of abundance, an intuitive lifestyle and mindfulness are preconditions for effective biological control and stable body weight. We do know that calorie deprivation leads to changes in metabolism and hunger hormone regulation that can last for years, making it difficult to keep weight off. As well, caloric restriction can result in changes in cognitive and attentional functions that can lead dieters to become primarily focused on food. As compared to non-dieters, dieters feel hungrier due to a progressively more efficient metabolism, requiring a need to further reduce daily calories to continue to lose weight. 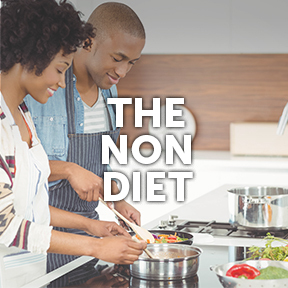 Dieting is a common practice, especially among individuals who are persistently overconcerned with body shape and weight, and therefore restrict their food choices to achieve weight loss without success, or with temporary success and weight regain. What is intuitive eating exactly? Basically, an intuitive eating approach consciously rejects the dieting mentality, allowing for a healthier, more authentic relationship with food. Some may think of this as a holistic approach that respects both physical and psychological wellbeing. Intuitive eating allows unconditional permission to eat and enjoy food, rejects the burden of chronic dieting, and advises listening to inner cues regarding hunger, satiety and satisfaction. Intuitive eating puts the spotlight on enjoying your food while tuning into your body’s health cues. While intuitive eating suggests you can eat what you like, it assumes that you respect your health and won’t see this as a green light to eat mainly non-nutritive processed and fast foods. Although the intuitive eating approach doesn’t condemn any foods, those who eat mindfully know that the best way to support good health, fulfill hunger and maintain a feeling of satiety between meals is to eat whole foods containing fiber and protein. Ultra-processed foods high in unhealthy fats and added sugars should be eaten sparingly, but still without shame, to not overpower the normal hormone-driven fullness signals. Intuitive eating is meant to relieve the stress and guilt that often accompanies weight management. It rejects the diet mentality and honors hunger, fullness and health, allowing an intuitive eater to think of food as nourishment rather than the means to an end. Those who truly progress toward better relationship with food find other ways to comfort and nurture themselves without appeasing their anxiety, boredom or loneliness by overeating. Leaving behind a preoccupation with thoughts of food, as well as an obsession with thinness, may be a difficult adjustment for some. After a few months of eating intuitively, many find they reach their natural set point weight, which may be higher or lower than imagined. Those who continue to take a respectful approach to nourishment tend to be less critical of their bodies, even with an increase in weight. Intuitive eaters report higher levels of overall satisfaction, as well as enhanced feelings of wellbeing and self-esteem. An intuitive lifestyle means engaging in healthy behaviors yet having the freedom to enjoy that occasional slice of cheesecake without monitoring calories. The freedom to choose a natural healthy weight means that weight is most likely to be maintained. One does not need a perfect body to feel well, nor have a perfect diet to be healthy. Additionally, being physically active and taking note of how it good it feels to move the body shifts the focus towards the health benefits of exercise and away from the calorie burning effects. Minimizing weight loss as a motivating factor, encourages daily exercise simply for the energizing, strengthening and health benefits of movement. It appears that mindfulness and consistency over time are what really matter to long-term physical health and psychological wellbeing.